I’m sure they’ll screw it up somehow but Dasha and Iulia want to be entrepreneurs and who am I to stop them? I was young once, walking in barefoot to Atari and demanding a job. Anyway, the photo above shows their first effort. It’s a T-shirt that says, “Every time you buy a Dell, a baby seal dies.” I think it’s a nice way to counteract Dell’s ridiculous Plant A Tree For Me program. The T-shirt was designed by dear reader Mikolaj, a creative genius from Poland. You can get a better image of the T-shirt on the Fake Steve Cafe Press shop, here. Also, the techies on staff have put a new button in the sidebar which takes you to the store. (You don’t think El Jobso knows how to do stuff like that himself, do you?) If you do try out the store let us know how it works. 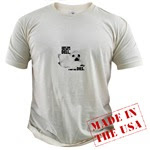 The T-shirt is organic cotton, naturally, because Apple is all about making green by being green, and the organic T is the most expensive model they offer at Cafe Press. We’ve also put the logo on a mug and a book bag. We’re working on more designs and hope to have them up soon. Peace out.